Dr. Jon Marc Van Slate uses the latest dental technology, such as the iTero® intraoral scanner, at his Houston, TX, practice. This state-of-the-art imaging tool generates accurate, 3-D impressions of your teeth. With this system, Dr. Van Slate can create unique treatment plans and make adjustments in real time. 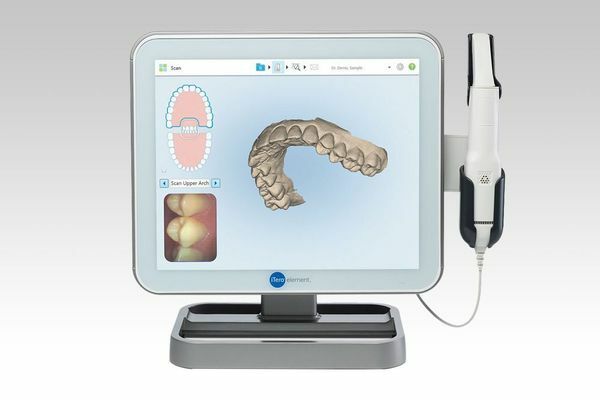 The iTero® scanner also allows him to keep you informed about your dental treatment since he can display the images on a chairside computer. Working with these scans, he can produce highly natural-looking crowns, bridges, veneers, and other restorations. The tool is also suitable for creating Invisalign® trays that can achieve the best possible results. The iTero® produces precise images to help create optimal treatment plans. Manufactured by Align Technology, Inc., the makers of Invisalign®, iTero® combines the latest laser and digital technology for outstanding results. Dr. Van Slate will use a small, handheld tool to scan your teeth. The tip will emit lasers to gather detailed information about the shape and size of each tooth. This data will upload to a computer, displaying 3-D models. iTero® can capture images of one or two teeth or of your whole bite. Thanks to the accuracy of the iTero® scans, your restorations will be a precise fit for your bite, and they will blend beautifully with the rest of your teeth. How Do We Use iTero® Scanners? After creating digital impressions, Dr. Van Slate will manipulate these images to create a customized treatment plan. Often, he will use these images to fashion crowns, bridges, and porcelain veneers, as well as inlays and onlays. He can also use them to produce implant-supported restorations. Thanks to the accuracy of the iTero® scans, your restorations will be a precise fit for your bite, and they will blend beautifully with the rest of your teeth. When you choose Invisalign®, Dr. Van Slate will use the iTero® scanner to design the trays in almost all cases. With these images, he can view the precise shape of your dental arches and create aligners that fit comfortably but firmly around your teeth. Because he can manipulate the images on the computer, he can also predict the way that your teeth will shift over the course of your treatment. Thus, he can determine the right shape for each successive aligner to achieve optimal results. Accuracy: The iTero® scanner will make impressions of your teeth with 100,000 points of reference. Therefore, the images will precisely correspond with the shape and proportions of your teeth. Additionally, Dr. Van Slate can rotate the images to view them from various angles. This suits his meticulous approach to dentistry as he formulates your one-of-a-kind treatment plan. Comfort: To take traditional impressions, your dentist would need to use a lengthy process using uncomfortable dental trays and thick, messy gel. In contrast, iTero® scans take just minutes, and the scanner does not come in contact with your teeth. Convenience: Dr. Van Slate can easily archive the digital images for quick and easy access in the future. This system can make record keeping easier, and it will often speed your appointments. Personalized care: Our team is passionate about patient education. By involving you in the process, we can help you make informed, confident decisions about your treatments. iTero® makes patient education easy. We can display the images of your teeth in real time during your appointment. You deserve to enjoy the benefits of the finest dental technology. Call our office at (713) 783-1993 or contact us online today to schedule an appointment. Our knowledgeable staff can tell you all about our innovative techniques and how they can benefit you.